This new block is built specifically for the drag race market and is an ideal fit within rules that do not allow billet blocks by specifying they must be cast. 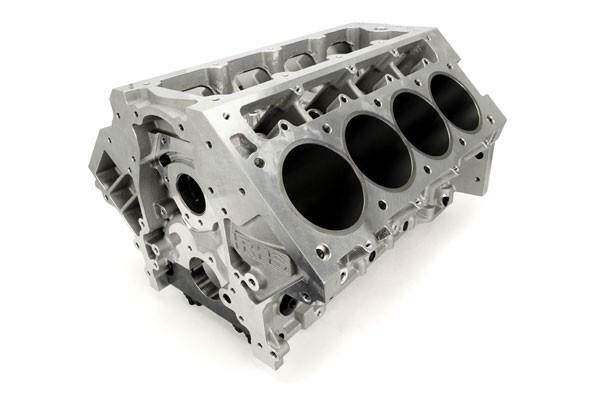 A solid water jacket design featuring A357-T6 aluminum material provides the superior crankcase strength and improved rigidity perfect for crank-mounted superchargers and blowers. The block utilizes the LSX 6-head-bolt design as in the original LS Race Block, but the head stud fasteners’ diameter has been increased to 1/2” for the inboard head studs and 3/8” for the 5th and 6th head bolts. The larger fasteners provide additional clamping force for increased head gasket retention. This is required for the higher cylinder pressures common in boosted applications.